SI covers NBA Finals matchups that could swing the series, with topics including Kevin Love's weaknesses, LeBron James's versatility and Stephen Curry's brilliance. No matchup is an island, entire of itself. Assigning any one basketball player to guard another has rippling implications for everything that happens on the floor. Game plans are formulated based on how the defense lines up and where it might be exploited. Actions are warped based on which players are involved on both sides of the ball. The work of a defensive stopper comes built-in with the opportunity cost of every alternative; assuming any specific responsibility foregoes another, making even the smallest lineup decisions an act of compromise. Basketball might not be a terribly complicated game, but it is complex in the way that all constantly evolving systems tend to be. By the end of the 2015 Finals, Golden State had bounced Andrew Bogut from the rotation entirely and come to entrust Draymond Green as their default center. It was small ball that unlocked the series; Cleveland’s frontcourt, undercut by Kevin Love’s season-ending shoulder injury, didn't have the means to run with the Warriors or defend them in space. Kyrie Irving’s absence further compromised the rotation to the point that it couldn’t really adjust once Golden State broke loose. The dynamic refreshes with Love and Irving’s return, the addition of Channing Frye, and Cleveland’s newfound love of three-point bombing. Attacking and defending the Cavs now demands a different formula; starting Green at center simply doesn’t offer the same jolt that it did when Timofey Mozgov was his positional counterpart, left to plod his way through awkward cross-matches. Starting Bogut makes sense now in a way it didn’t then. Tristan Thompson is the closest thing Cleveland has to a traditional center in its rotation, which gives Bogut his best chance to play a role in this series by offering an anchor to the paint. 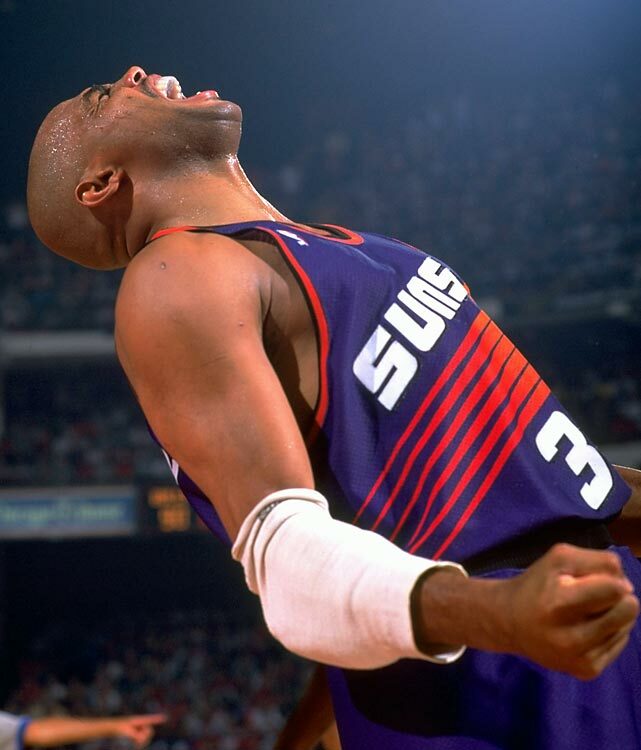 Deny him that opportunity and he’ll be pulled out of his game to guard the likes of Frye or Love at the three-point line. The last thing Cleveland should want is Love pulled out, 25 feet from the basket, to either hedge or switch on to Stephen Curry in the pick-and-roll. 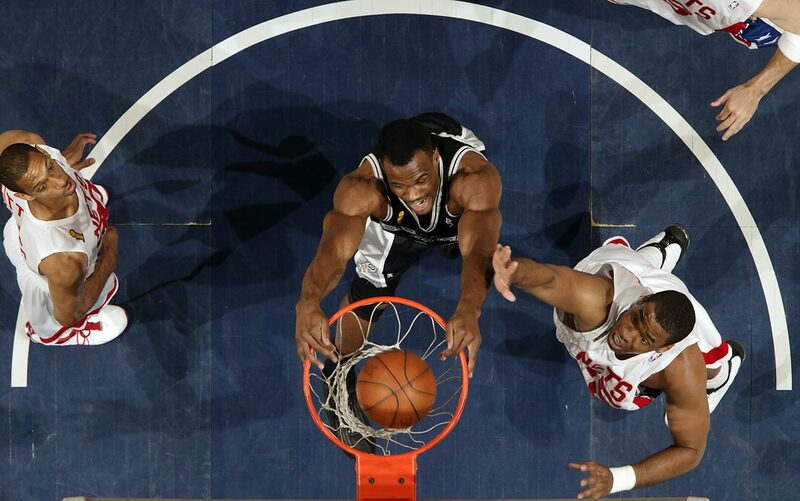 Love’s solid defense this postseason hasn’t gone unnoticed. That particular job, however, is beyond him—demanding better communication, quicker feet, and more productive instincts than he could reasonably claim. Golden State will go out of its way to put Love to the test at every opportunity. There’s nowhere to hide completely, though certain matchups offer Love more cover than others. Bogut is among the most preferable. At this stage in his career, Bogut is both rangeless and fairly slow—qualities that render him significantly less dangerous in pick-and-roll or dribble hand-off situations than, say, Green. 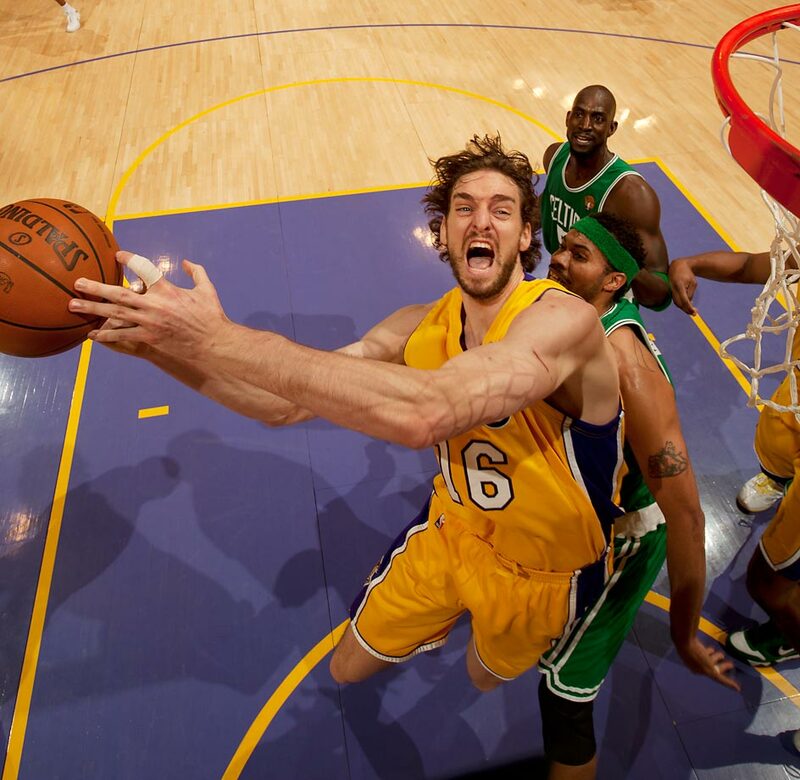 Any Bogut screen would allow Love to focus on guard attainment for a few beats with relatively little risk; a smart, well-coordinated defense can generally handle Bogut’s rumbles down the lane without compromising too much elsewhere on the floor. 1952: Minneapolis Lakers 4, New York Knicks 3. 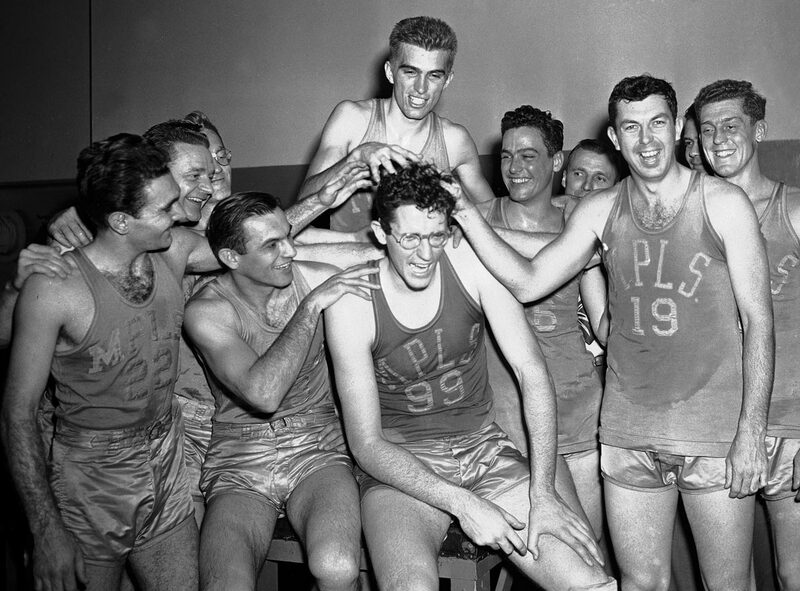 George Mikan averaged 21.7 points and 17.4 rebounds, and the Lakers beat the Knicks in seven games. The teams alternated wins and losses in each game. 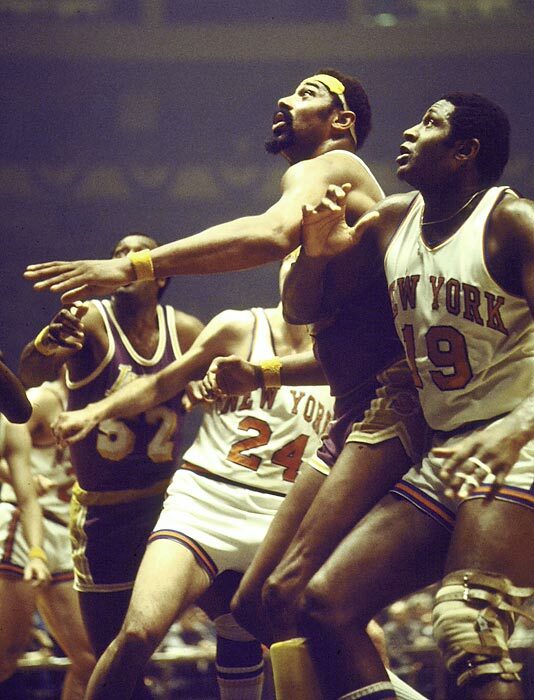 — 1953: Minneapolis Lakers 4, New York Knicks 1. 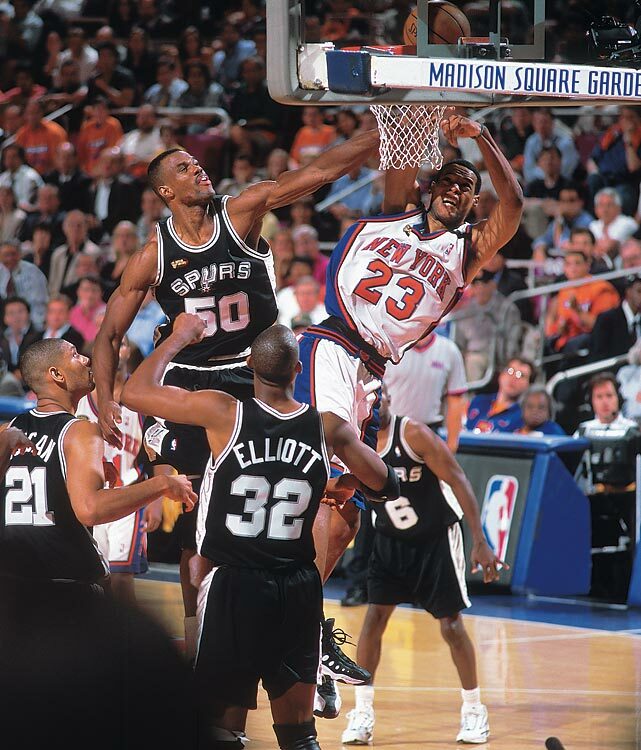 Mikan was dominant again, averaging 20.8 points. The Knicks took Game 1 on the road, but the Lakers won the next four — keyed by two two-point triumphs. 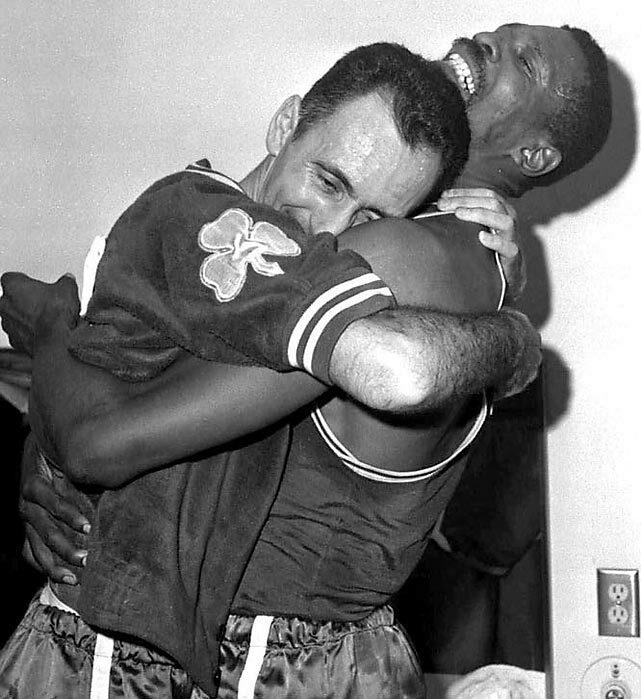 1957: Boston Celtics 4, St. Louis Hawks 3. A tremendous series, with four of the seven games decided by two points — including Game 7, the Celtics winning 125-123 in double overtime. 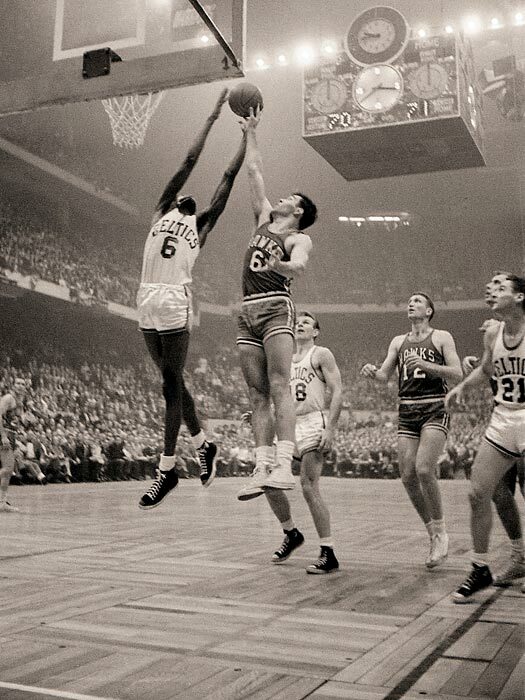 — 1958: St. Louis Hawks 4, Boston Celtics 2. Denied a title the previous year, Hawks star Bob Pettit averaged 29.3 points and 17 rebounds — with 50 points in the Game 6 clincher. 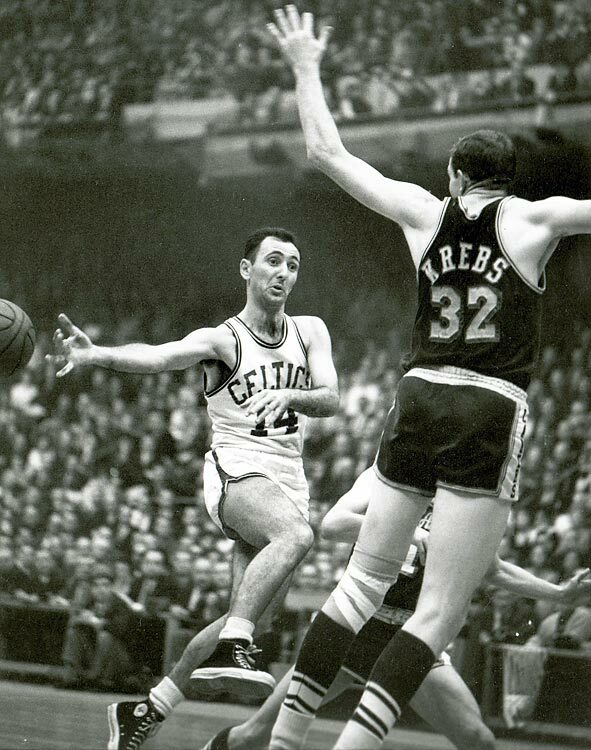 1960: Boston Celtics 4, St. Louis Hawks 3. 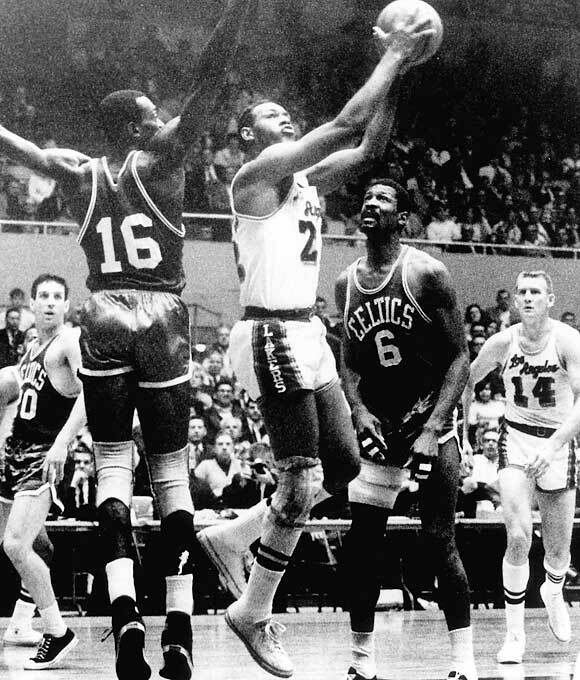 Tom Heinsohn averaged 22.4 points, Bill Russell averaged 24.9 rebounds and the Celtics got four double-digit wins, including a 122-103 victory in Game 7. 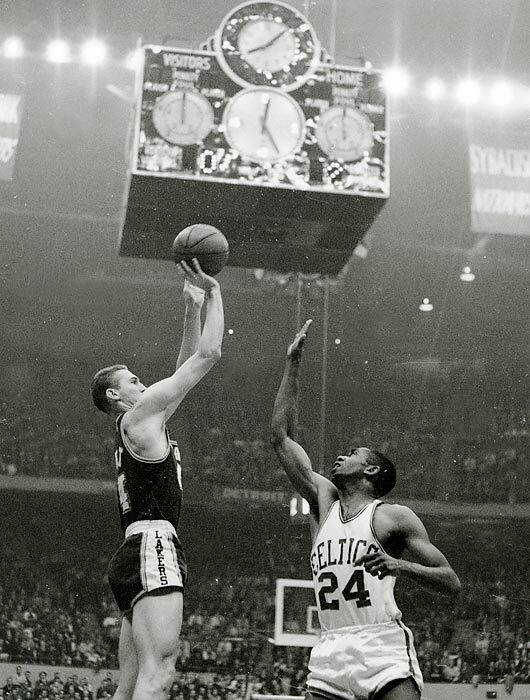 — 1961: Boston Celtics 4, St. Louis Hawks 1. More of the same. Heinsohn led the Celtics in scoring again at 22 points, Russell grabbed an astounding 28.8 rebounds and Boston easily defended its title. 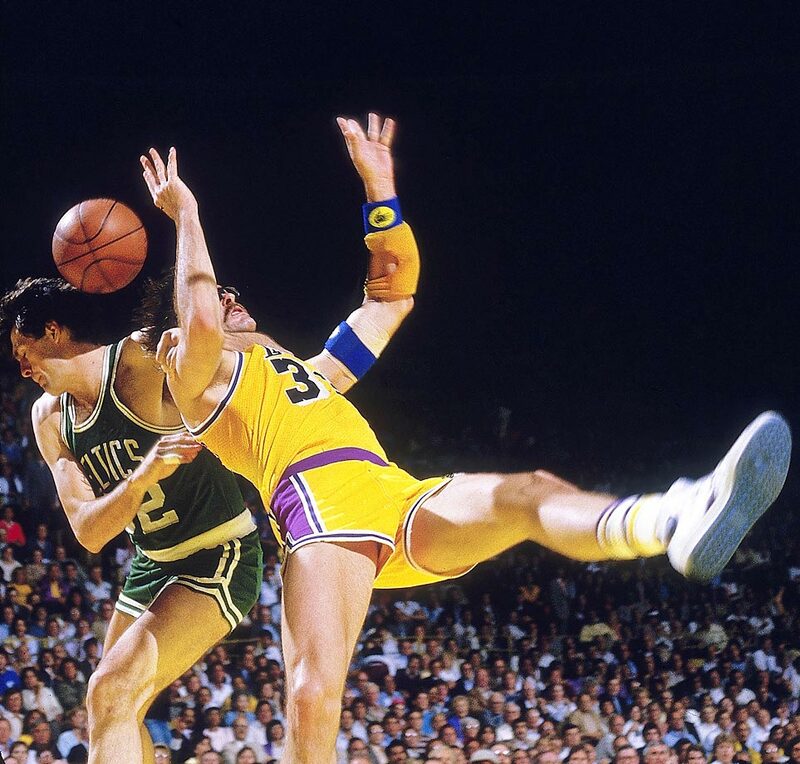 1962: Boston Celtics 4, Los Angeles Lakers 3. 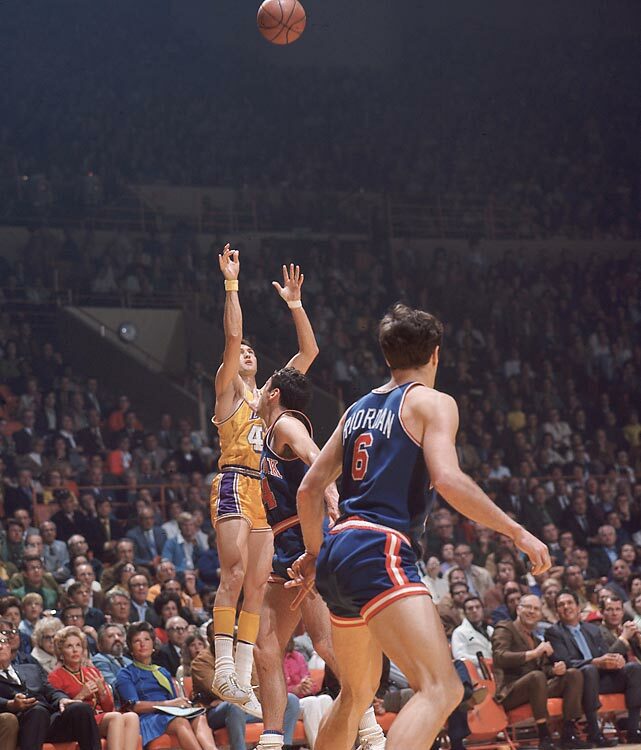 Lakers stars Elgin Baylor (who had a 61-point game, a Finals record) and Jerry West were brilliant, averaging 72 points per game. 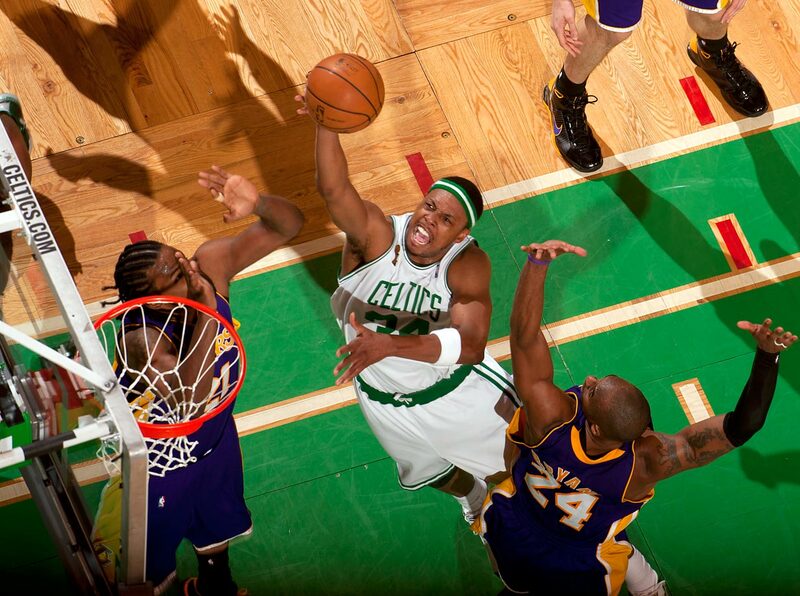 But the Celtics rallied from 3-2 down. 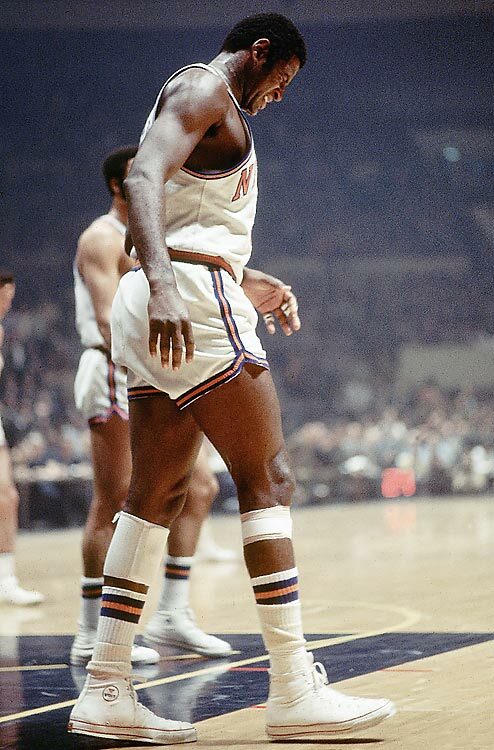 Bill Russell averaged 22.9 points and 27 rebounds for Boston. 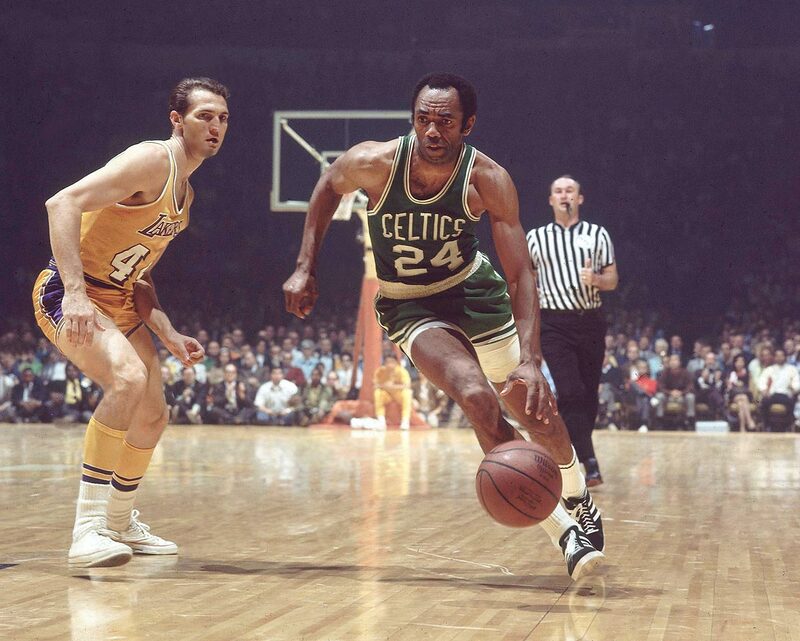 — 1963: Boston Celtics 4, Los Angeles Lakers 2. 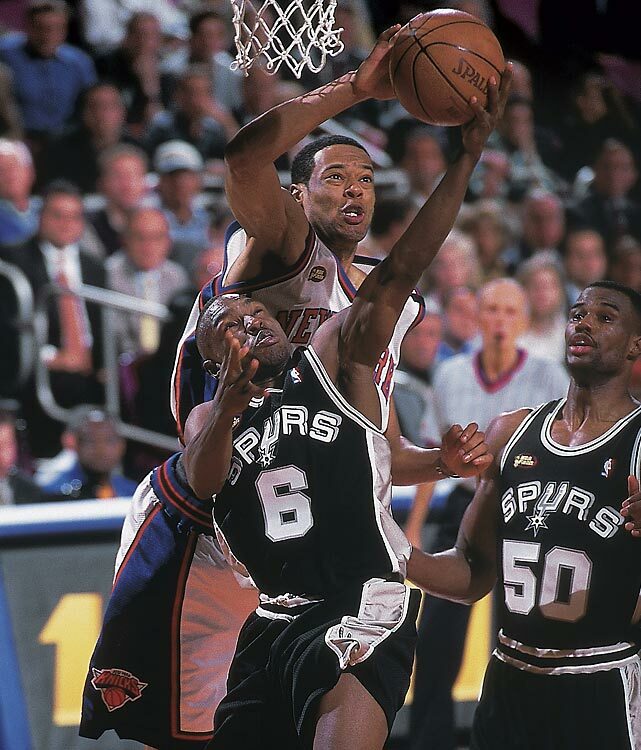 Baylor and West averaged 63 points per game. 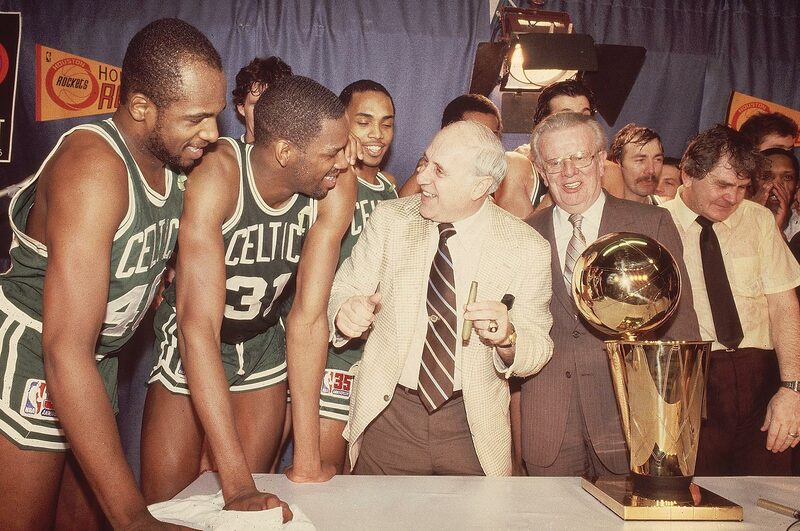 The Celtics, with Sam Jones, Tom Heinsohn and Russell leading the way, had too much depth and balance. 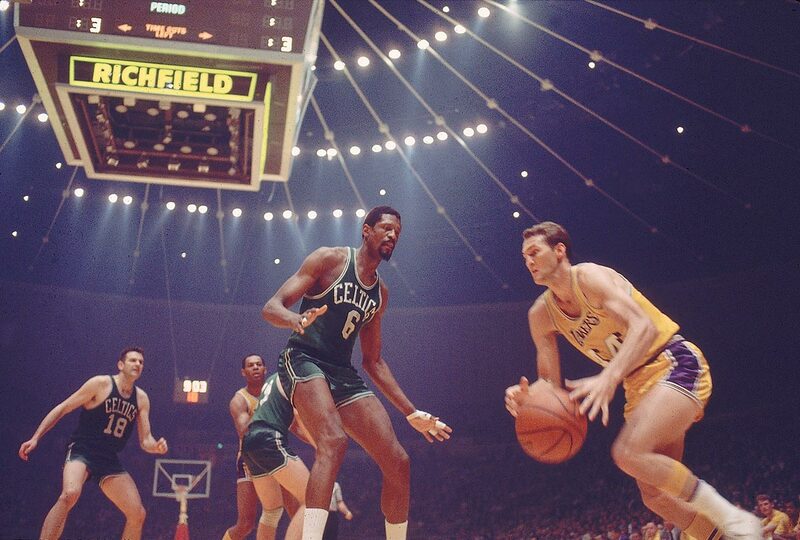 1968: Boston Celtics 4, Los Angeles Lakers 2. Boston blew a big lead in Game 5 at home but won in overtime, then closed it out on the road in Game 6 behind 40 points from John Havlicek. 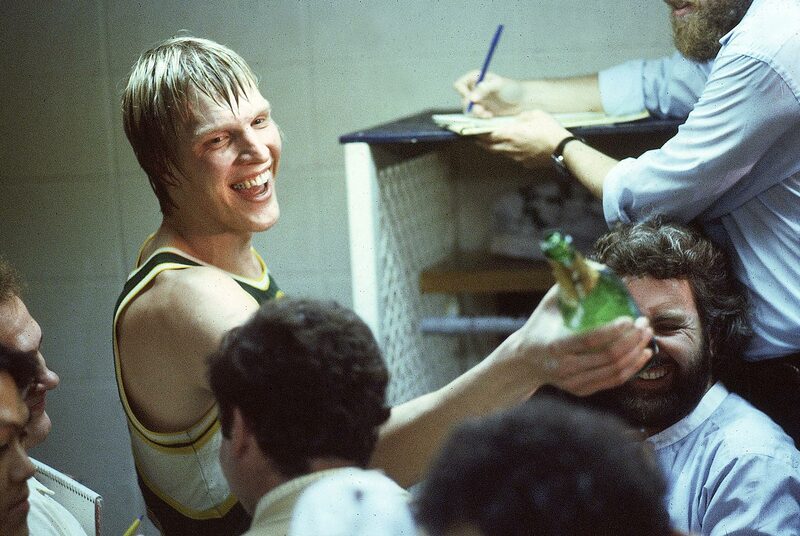 — 1969: Boston Celtics 4, Los Angeles Lakers 3. The Celtics’ dominance over the NBA continued, Boston winning its 11th title in a 13-year span. Jerry West won the MVP award, in a losing effort. 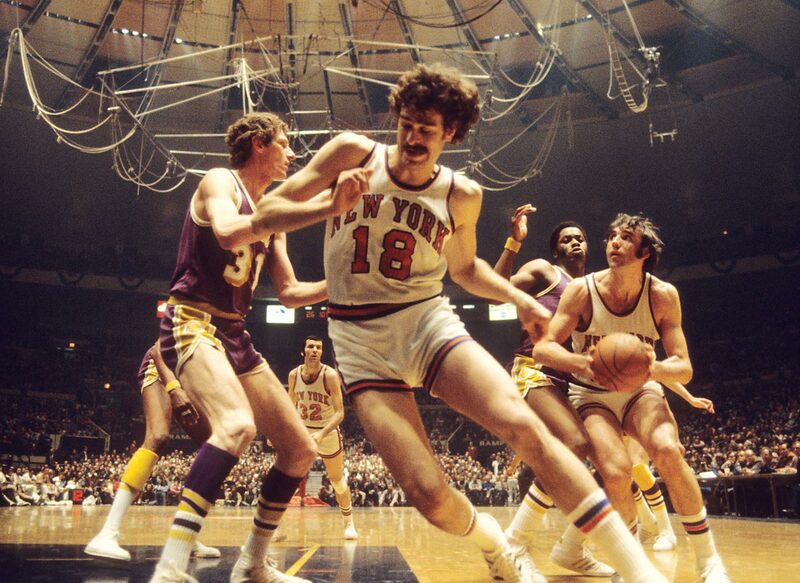 1972: Los Angeles Lakers 4, New York Knicks 1. 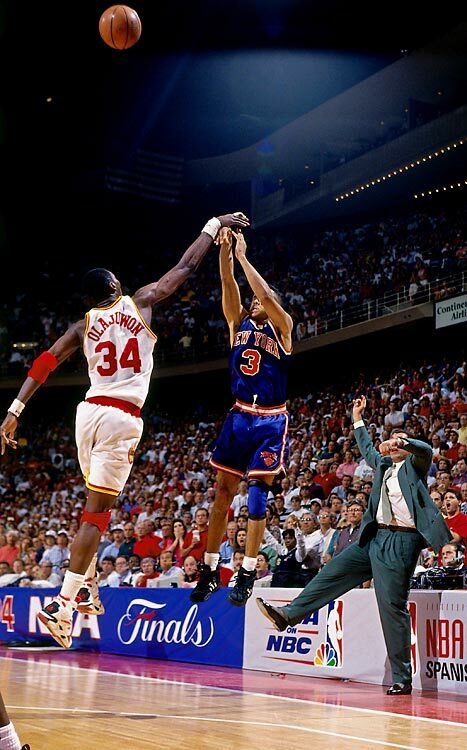 The Knicks rolled in Game 1, and after that it was all Lakers. 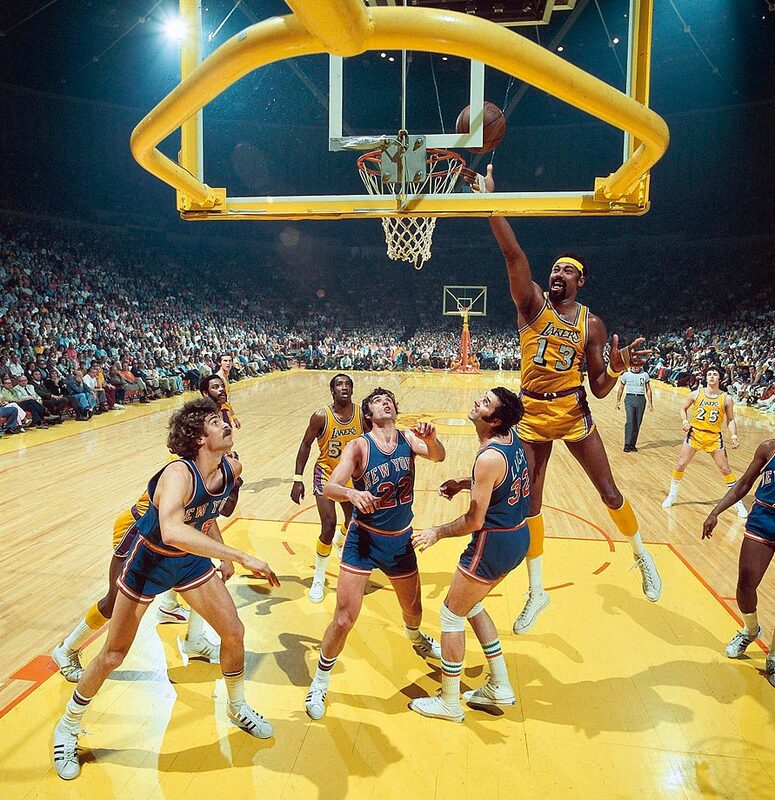 Wilt Chamberlain (19.4 ppg, 23.2 rpg) wins MVP honors, leading the Lakers to the win. 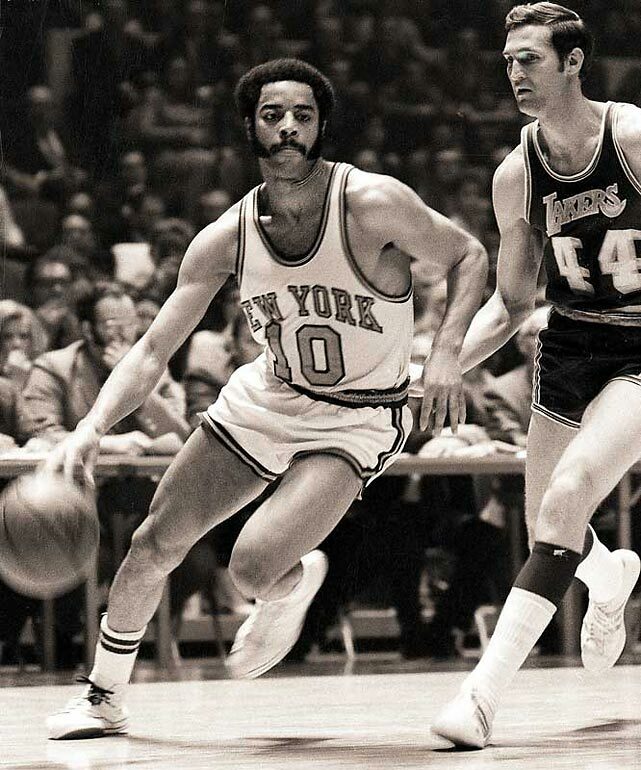 — 1973: New York Knicks 4, Los Angeles Lakers 1. 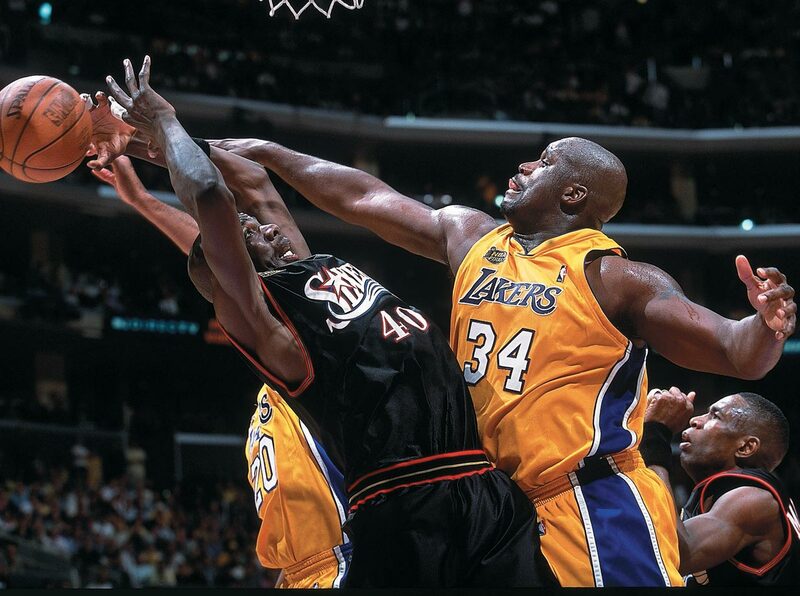 Turnabout was fair play; the Lakers grabbed a 1-0 lead and then the Knicks won out. 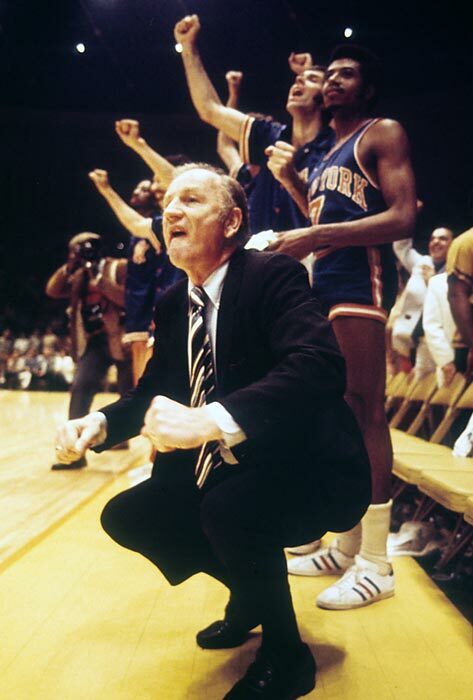 It was Chamberlain’s last game, and the Knicks’ most-recent title. 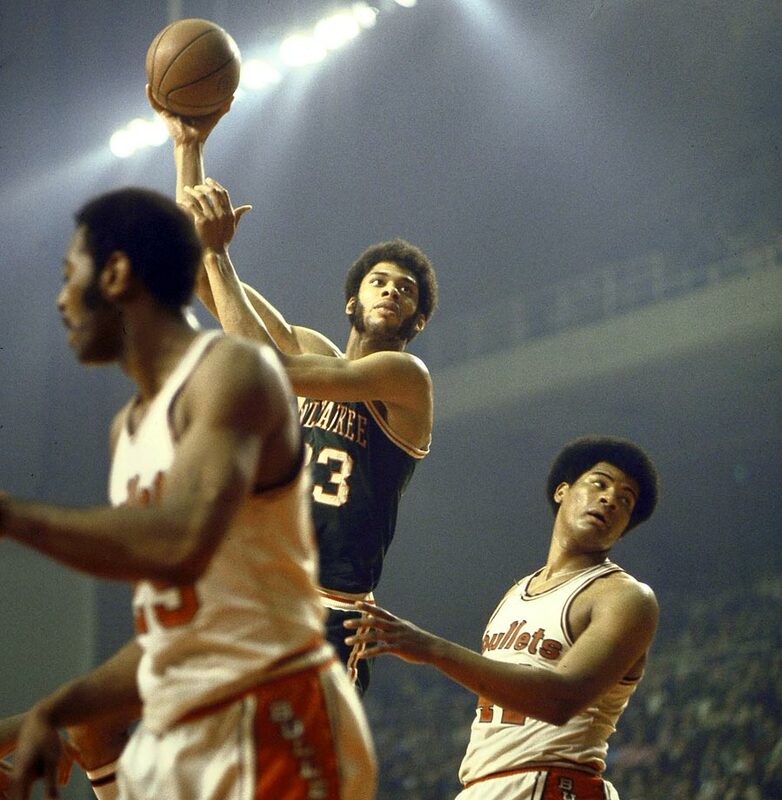 1978: Washington Bullets 4, Seattle SuperSonics 3. Seattle led 1-0, 2-1 and 3-2 — but the Bullets took Games 6 and 7. 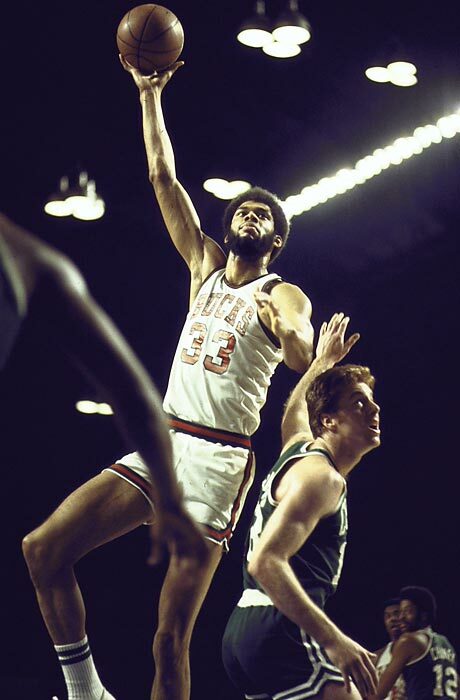 Wes Unseld was Finals MVP, averaging 9 points and nearly 12 rebounds per game. 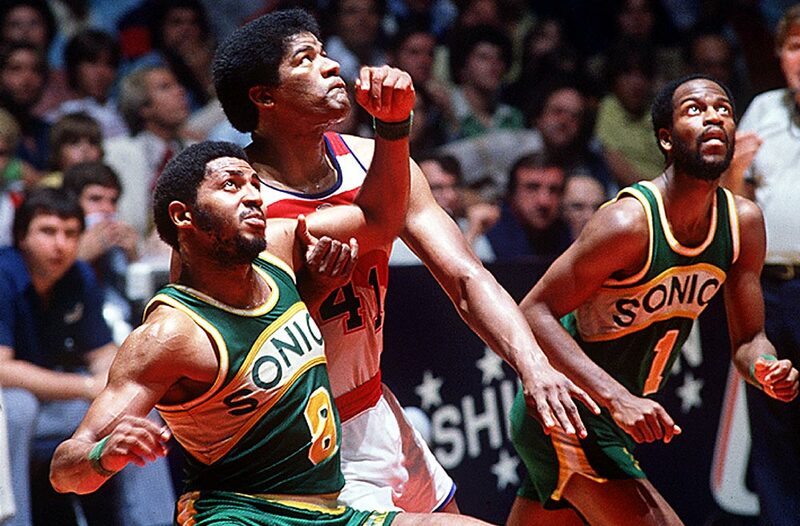 — 1979: Seattle SuperSonics 4, Washington Bullets 1. 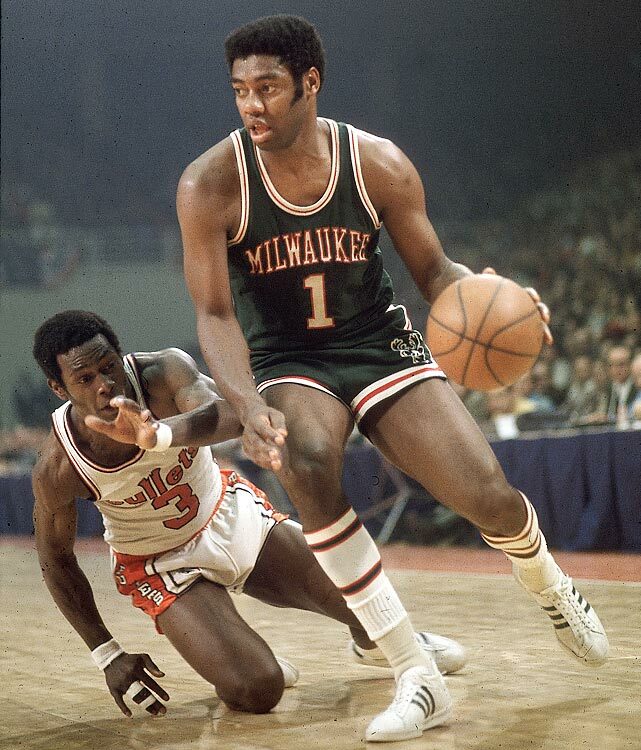 Gus Williams averaged 28.6 points, Finals MVP Dennis Johnson added 22.6 points and Seattle won the last four games of the series. 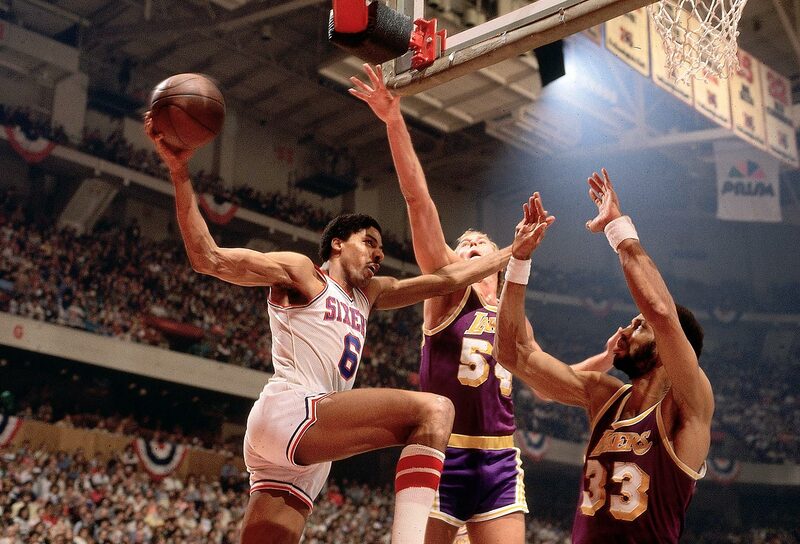 1982: Los Angeles Lakers 4, Philadelphia 76ers 2. 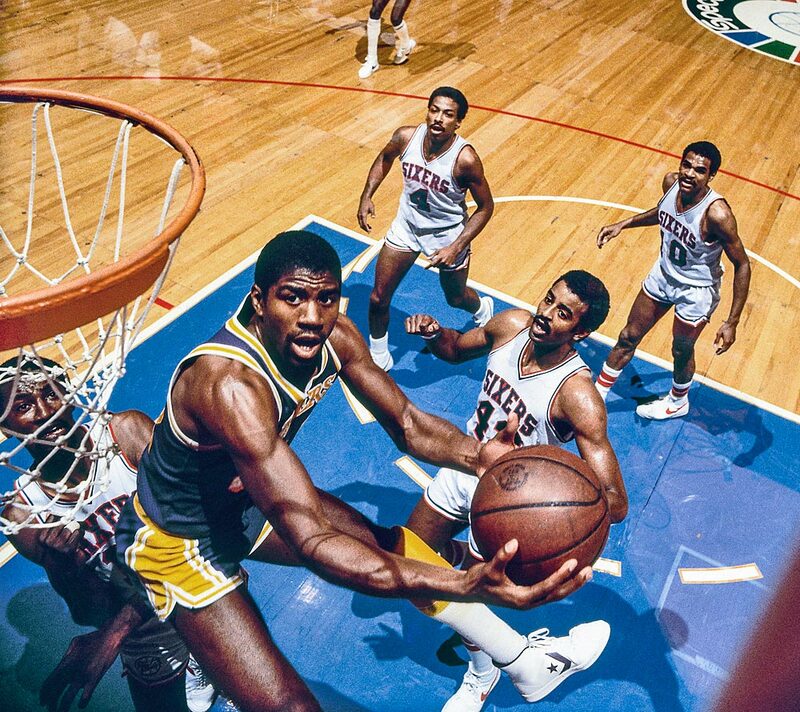 Magic Johnson caps an MVP performance with 13 points, 13 rebounds and 13 assists in Game 6, and the Lakers win in Pat Riley’s rookie coaching season. 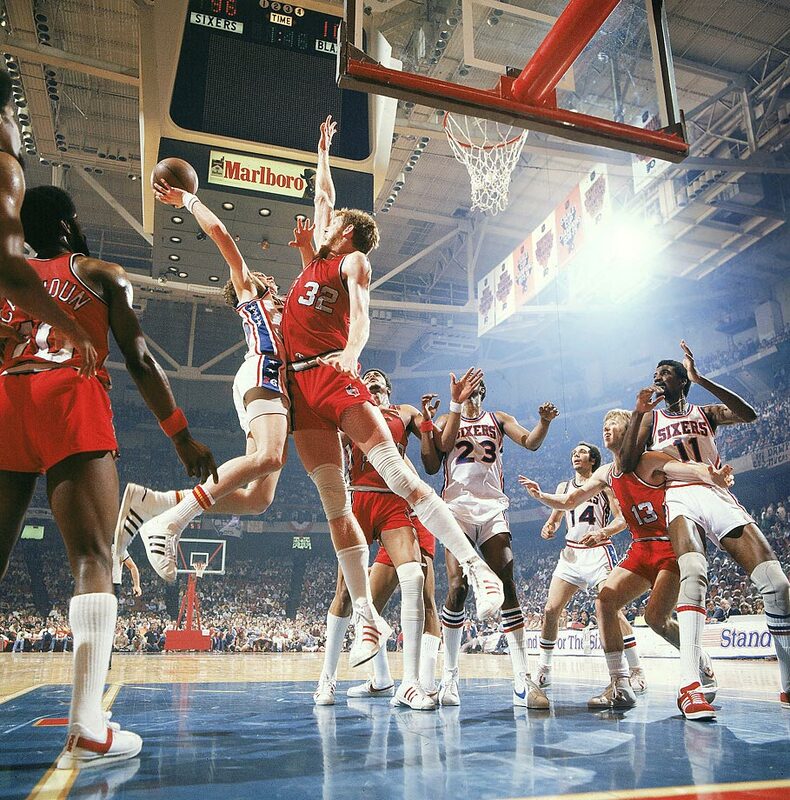 — 1983: Philadelphia 76ers 4, Los Angeles Lakers 0. 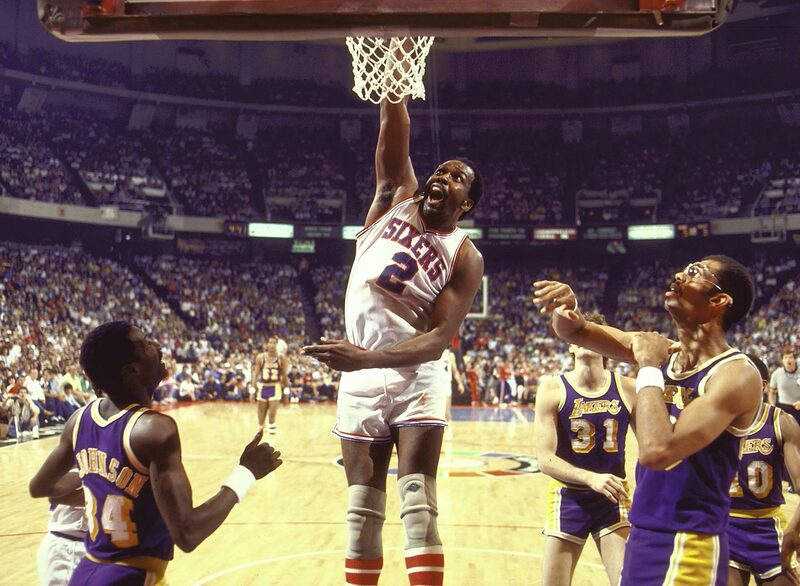 Moses Malone averaged 25.8 points and 18 rebounds, and the 76ers capped a dominant playoff run with a one-sided romp in the Finals. 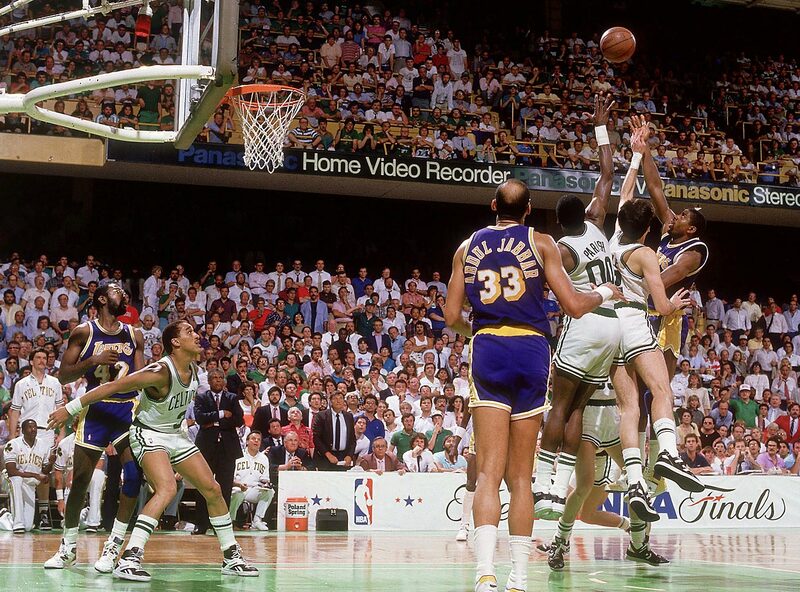 1984: Boston Celtics 4, Los Angeles Lakers 3. 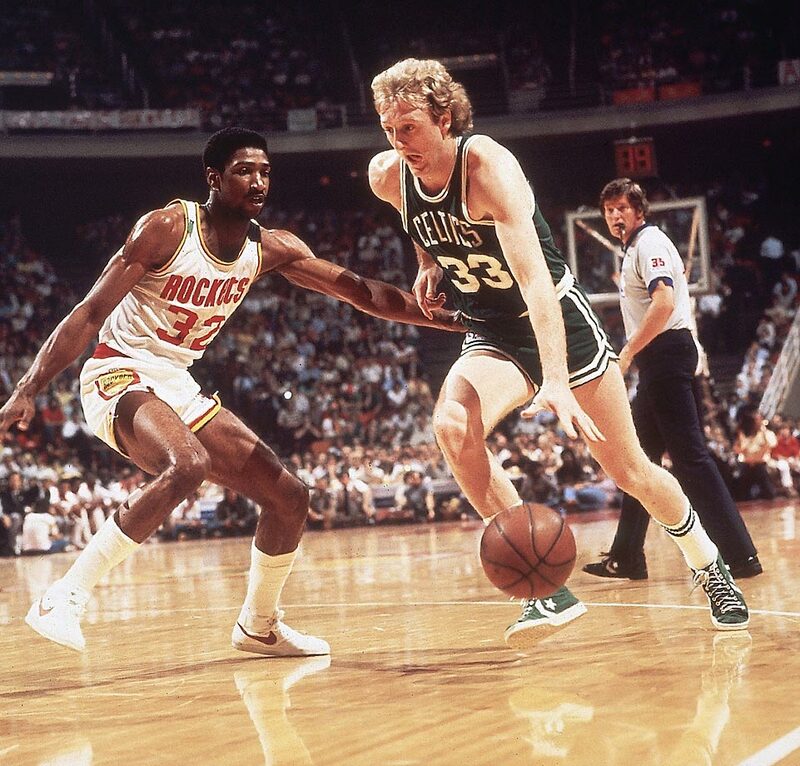 Cedric Maxwell’s 24 points in Game 7 and an MVP performance from Larry Bird lifted the Celtics to their 15th world title. 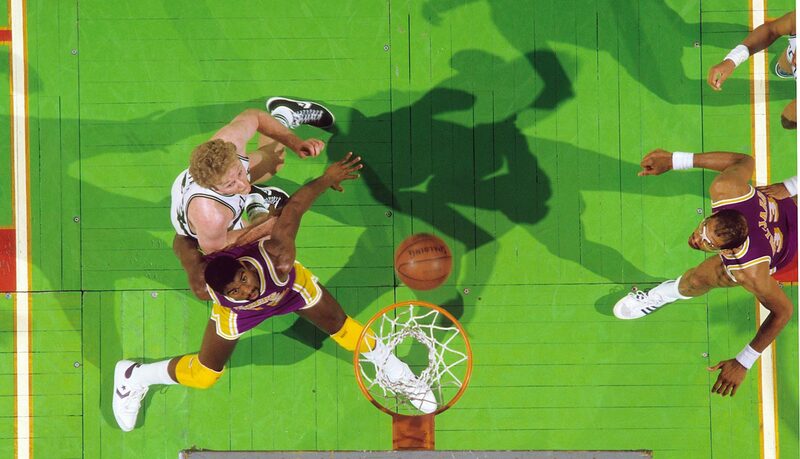 — 1985: Los Angeles Lakers 4, Boston Celtics 2. 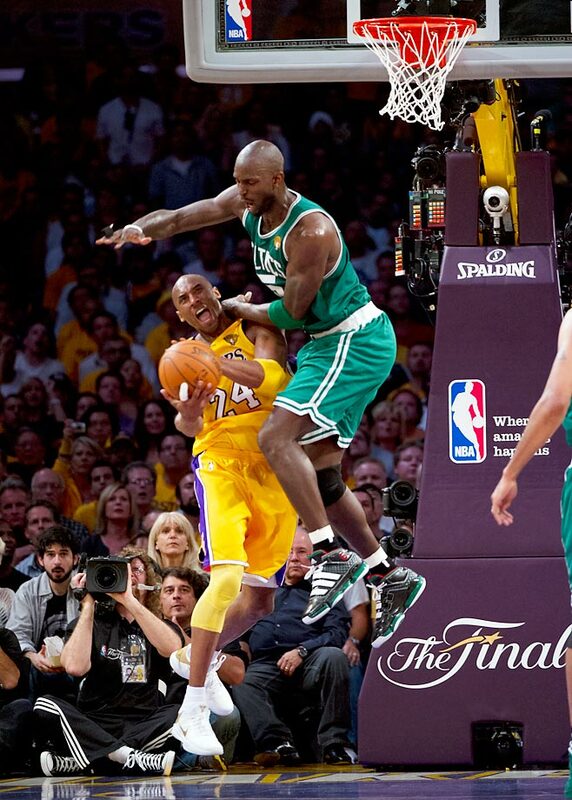 Game 1 was the “Memorial Day Massacre,” a 148-114 Boston win. 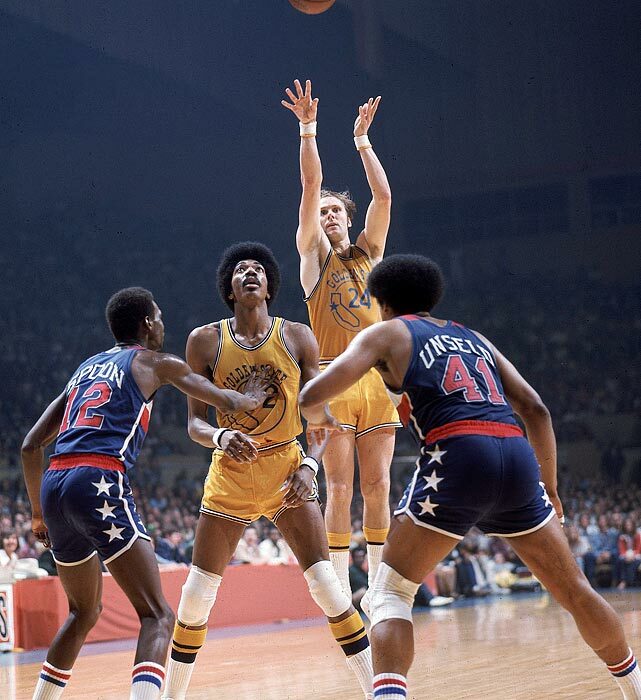 But the Lakers won four of the next five games, and Kareem Abdul-Jabbar won the MVP. 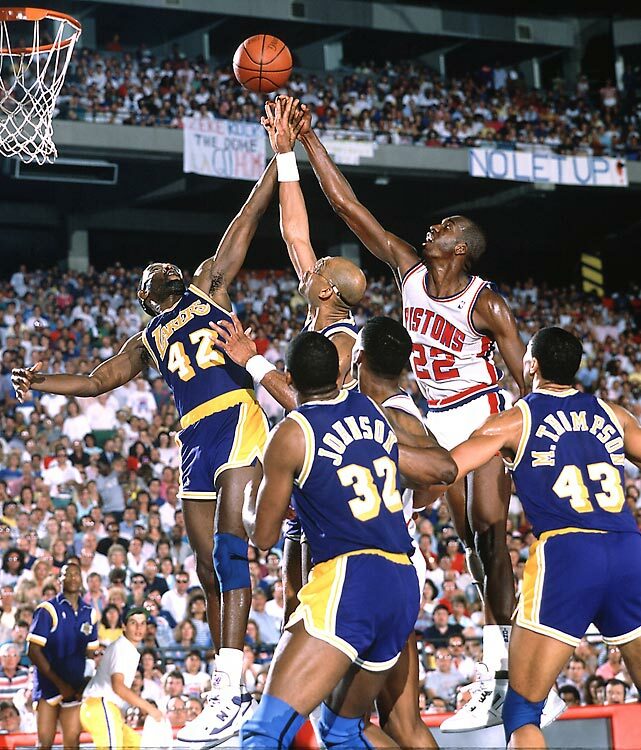 1988: Los Angeles Lakers 4, Detroit Pistons 3. 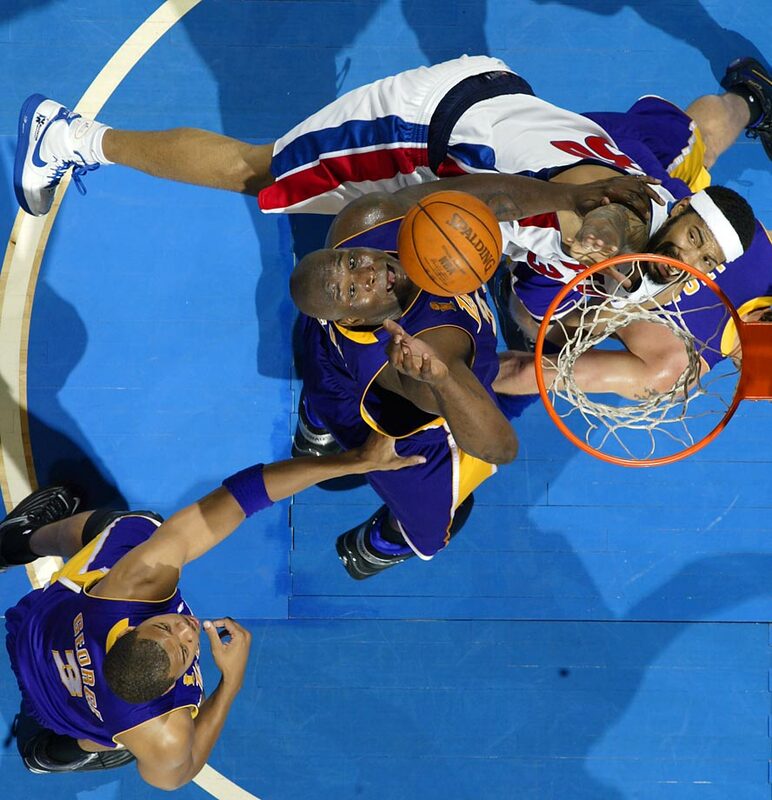 The Lakers win their second straight title, taking Games 6 and 7 by a combined four points. 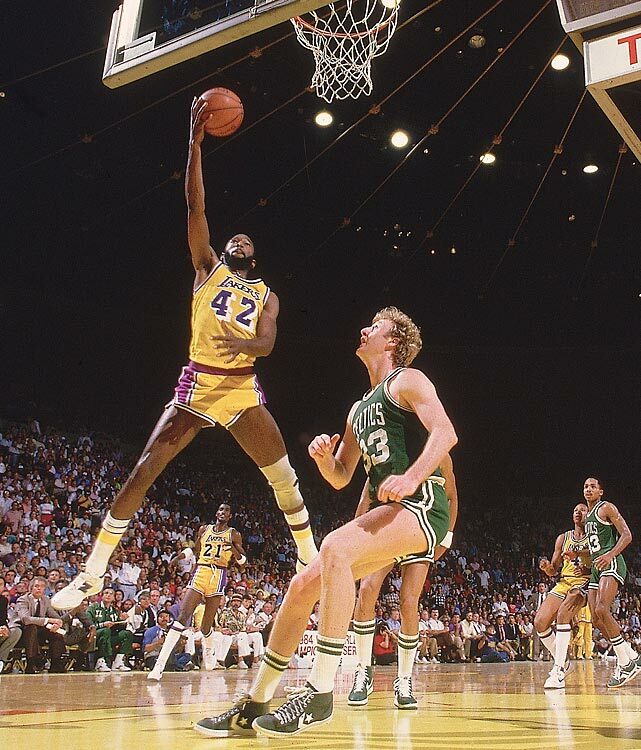 James Worthy scored 36 points in Game 7 for the Lakers. 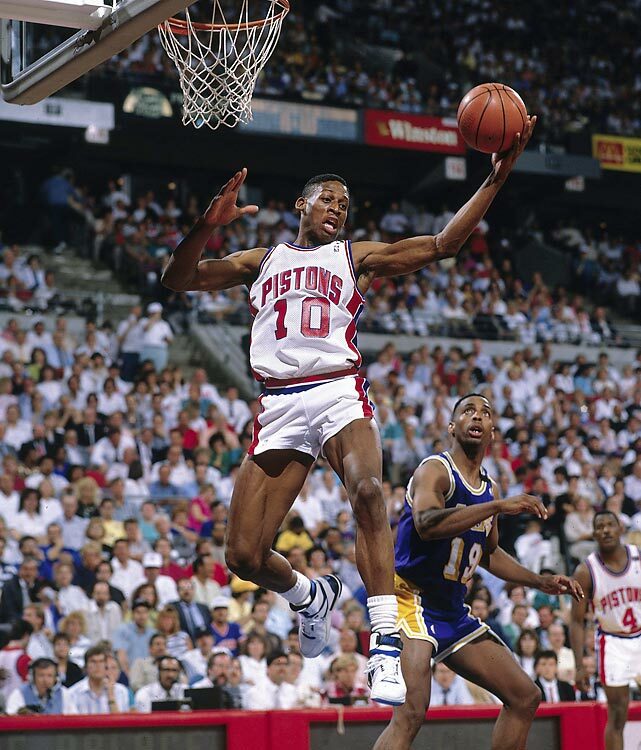 — 1989: Detroit Pistons 4, Los Angeles Lakers 0. 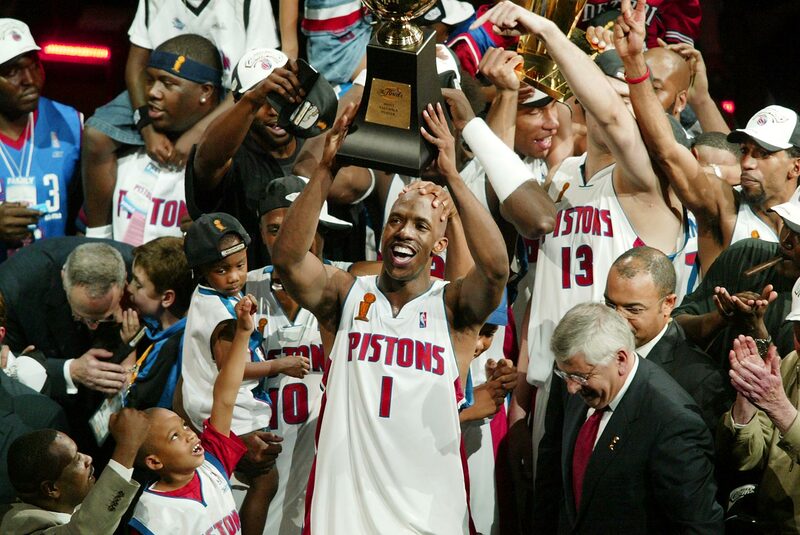 Detroit’s so-called “Bad Boys” proved best, sweeping to the title behind Joe Dumars’ 27.3 points per game. 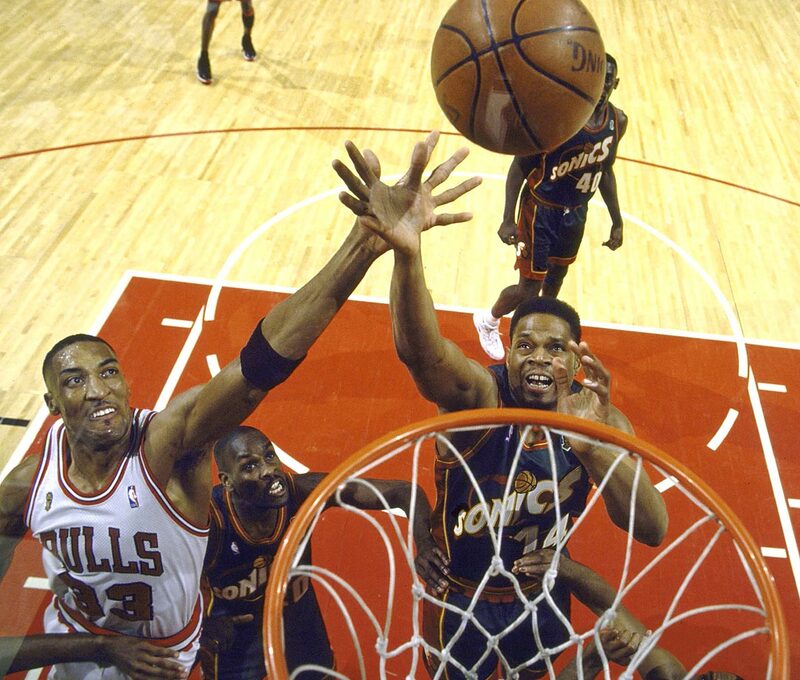 1997: Chicago Bulls 4, Utah Jazz 2. 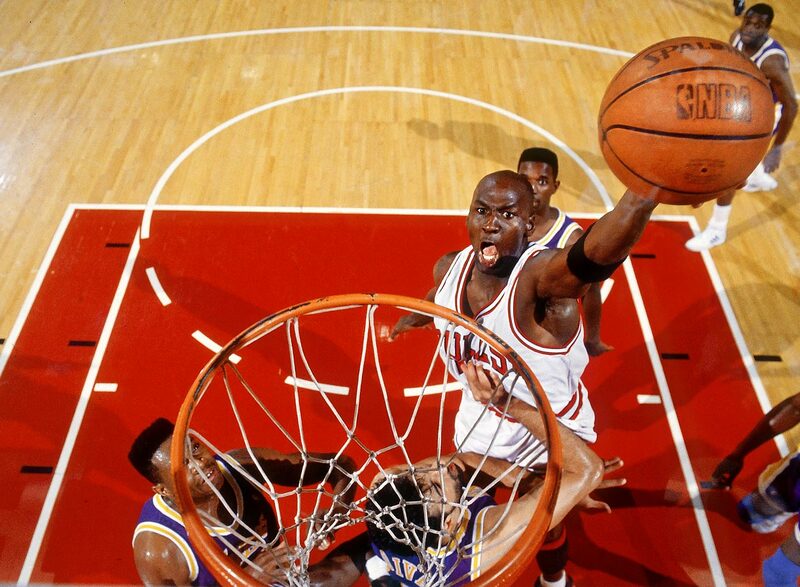 Michael Jordan wins MVP honors, he and Scottie Pippen average 52 points and the Bulls hold off Karl Malone, John Stockton and the Jazz. 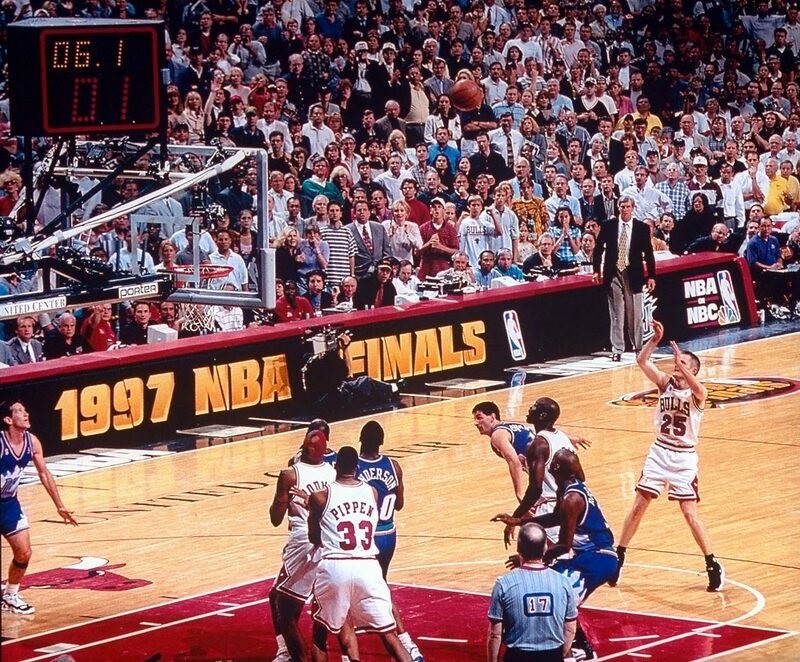 — 1998: Chicago Bulls 4, Utah Jazz 2. 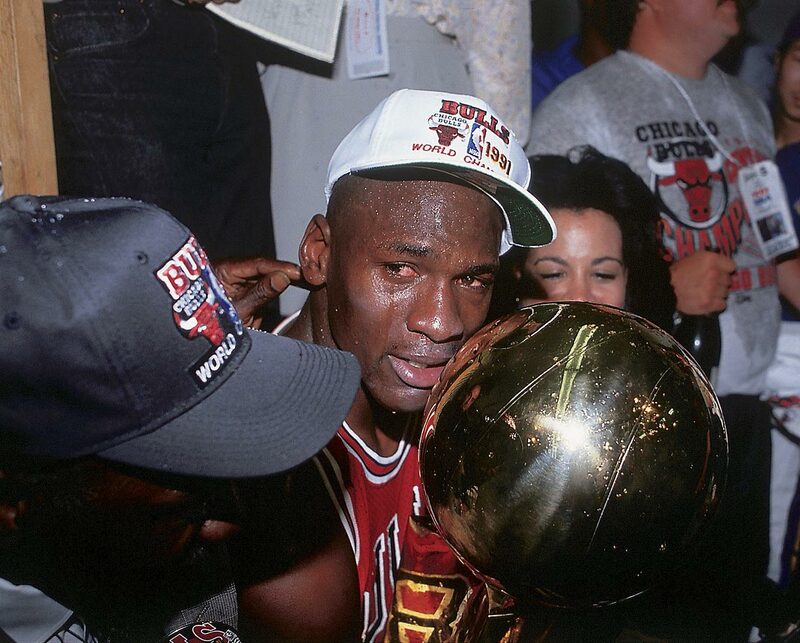 Jordan’s sixth and final championship was capped by a 45-point effort, punctuated by the go-ahead jumper in the final seconds of Game 6. 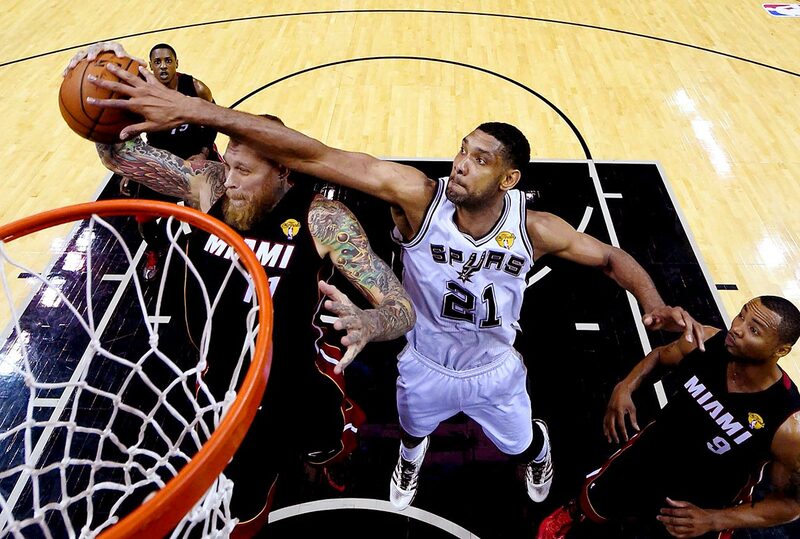 2013: Miami Heat 4, San Antonio Spurs 3. 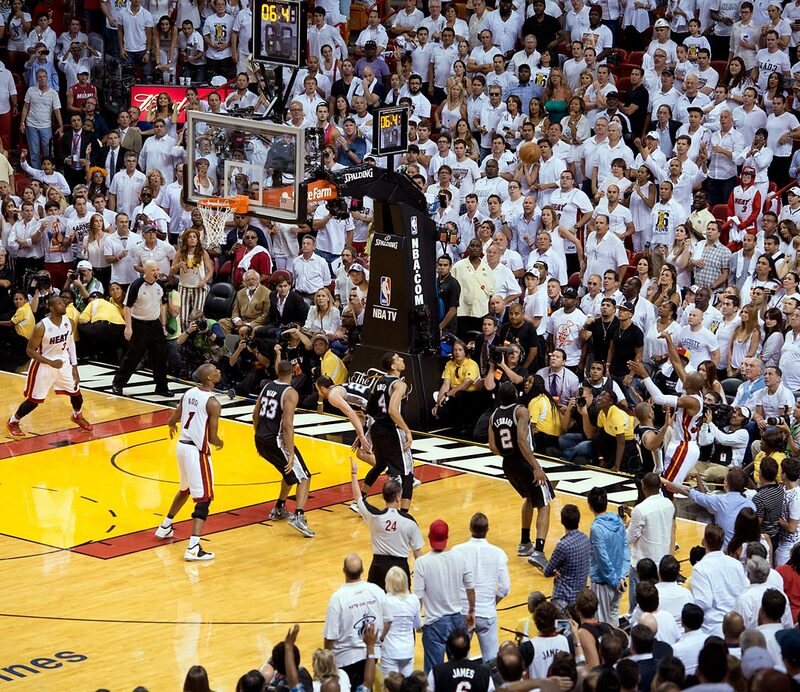 Ray Allen’s 3-pointer with 5.2 seconds left in Game 6 saves Miami, then LeBron James takes over late in Game 7 as the Heat go back-to-back. 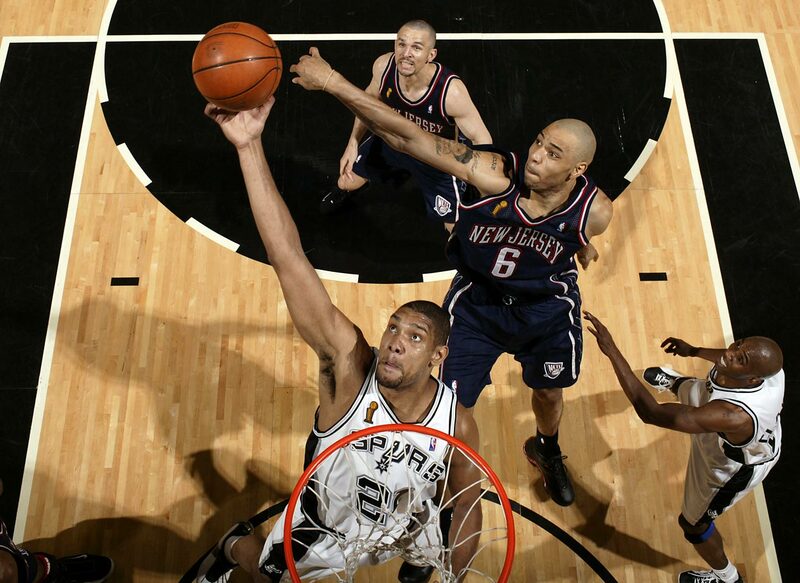 — 2014: San Antonio Spurs 4, Miami Heat 1. 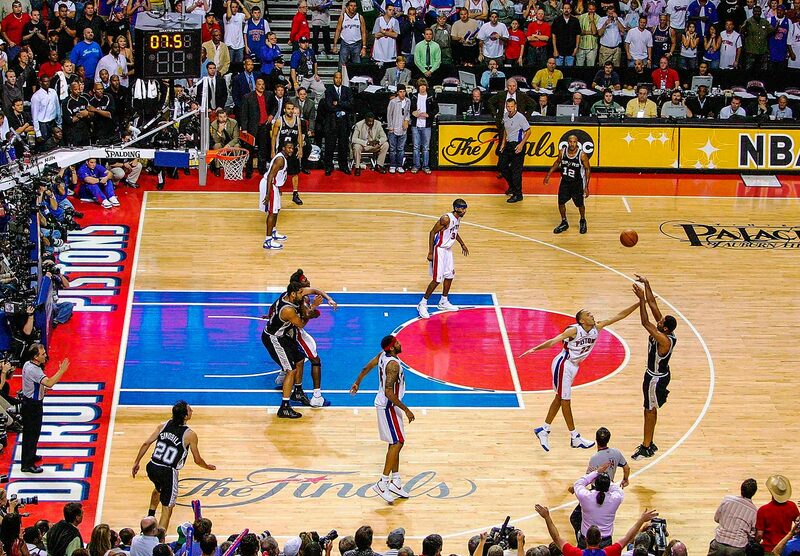 The Spurs split the first two games at home, then got two big wins in Miami and finished it off at San Antonio in Game 5 for their fifth title. The Warriors didn’t throw many deliberate double-teams at James in the 2015 Finals, but they applied pressure in their own way. 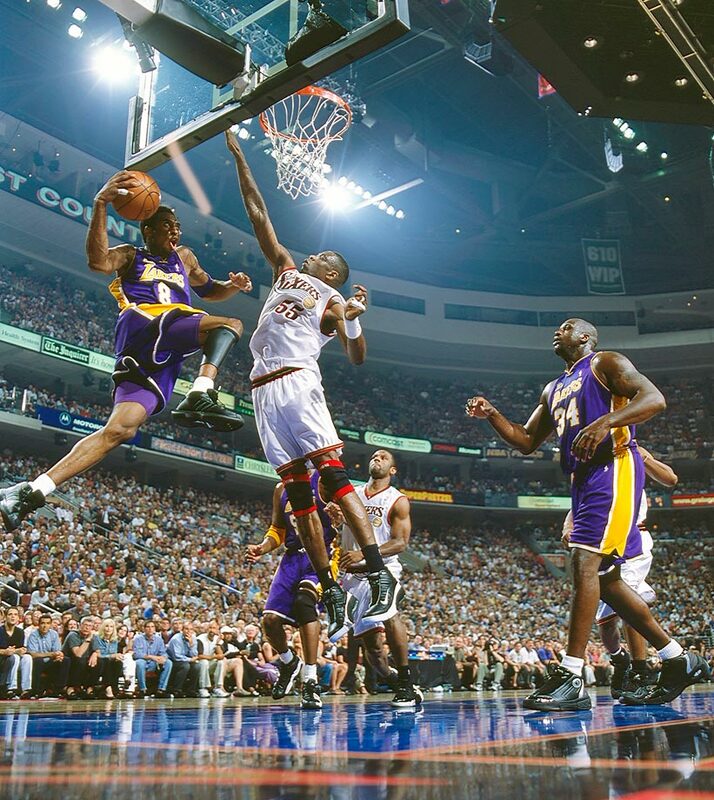 Iguodala, one of the best denial defenders in the league, made LeBron work for every catch and then held his ground after claiming sound defensive position. The rest of Golden State’s defenders took a step inward and extended their arms—showing James a wall to the weak side that simultaneously shrank the court and deterred long passes. One of the most dominant players in the league was reduced, in part by his team’s injuries, to iso-post inefficiency. James won’t be used in quite the same way now that Irving and Love are healthy again, though Iguodala remains Golden State’s top choice for contesting his post-ups and drives. Considering that Iguodala’s minutes will largely be tethered to LeBron’s, it would make sense for the Warriors to kick around the possibility of starting him at small forward—just as they did against Kevin Durant in Game 7 of the Western Conference finals. 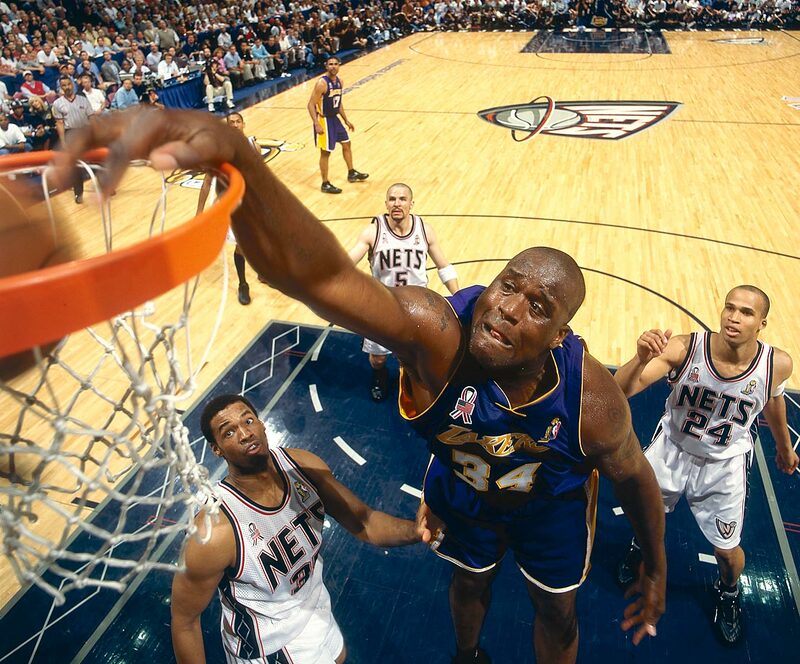 Barnes, who doesn’t move quite well enough to keep up with James, would be out of his depth in the opening minutes. Even Green didn’t fare well in the one-on-one matchup last time around, proof positive that LeBron can work over many of the best, most versatile defenders in the league. Never is Cleveland’s offense more fluid than when both of its bigs can stretch the floor. 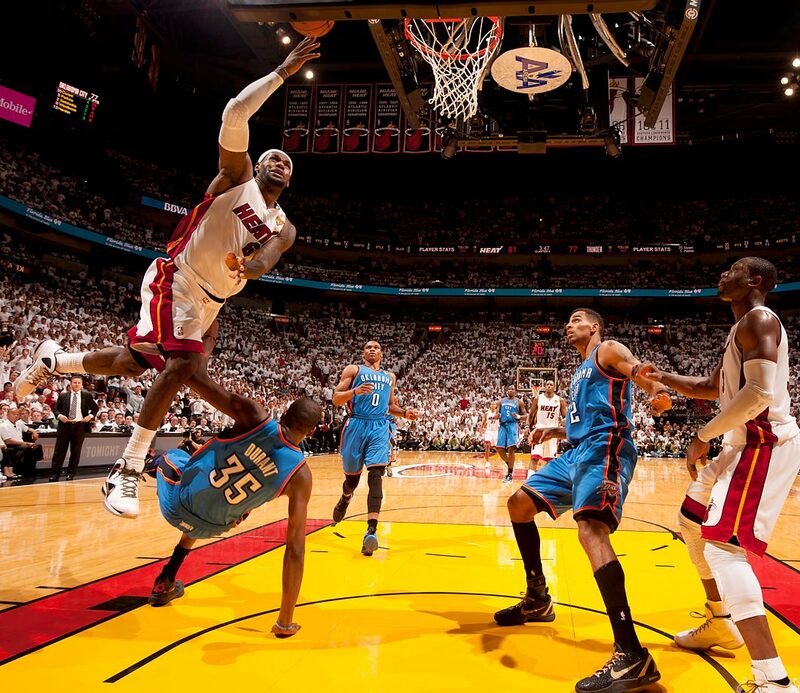 LeBron has buckled defenses throughout his career by making crisp passes from inside a swarm of opponents. Irving is so valuable because he can slice through consecutive layers of defense to finish at the basket. Remove those degrees of difficulty and the Cavs max out their scoring potential. 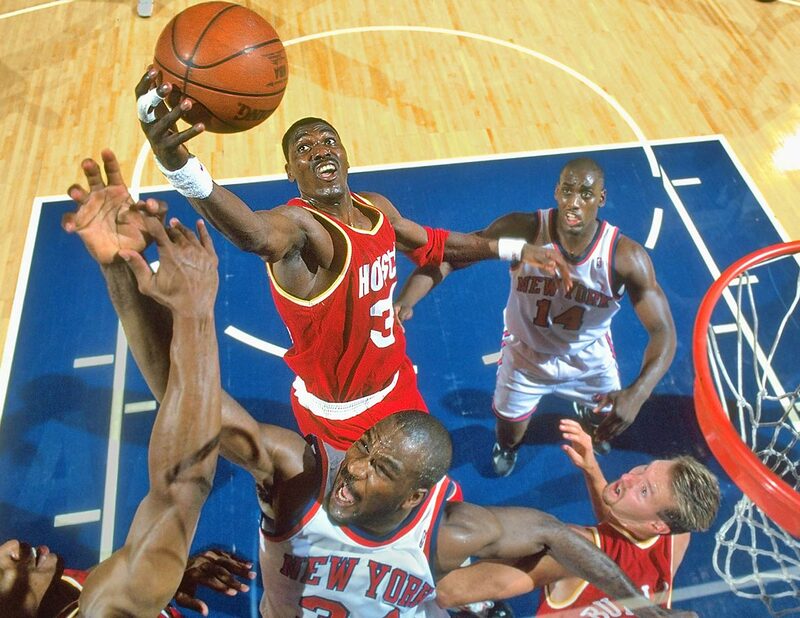 Open space is rarely more than a pass away—facilitated by Frye’s knockdown shooting and Love’s pick-and-pop game. Golden State will need to be mindful of these lineups in the same way that opponents must batten down the hatches when Green slides over to center. In limited minutes throughout these playoffs, Cleveland has scored 121.7 points per 100 possessions with Love and Frye on the floor together, per NBA.com—a significant improvement on what was already the best offense of the postseason on balance. Their pairing leaves Bogut with no one to guard, Speights in way over his head, and Anderson Varejao out of his comfort zone. Ezeli might at least be able to scurry between contesting Frye and maintaining his other defensive responsibilities, though the best antidote is the most obvious one: Green and Barnes as the Warriors’ functional, flexible bigs. 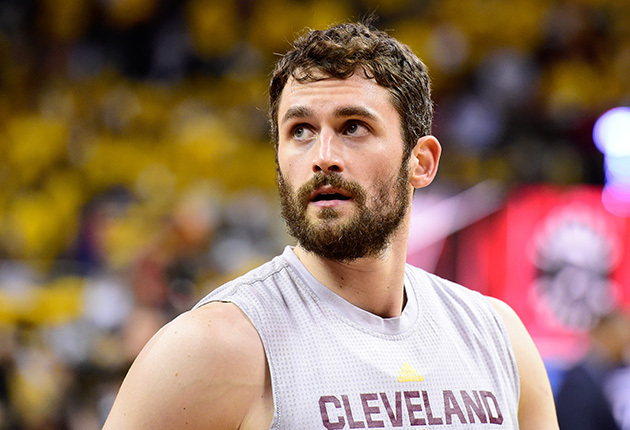 Cleveland’s best all-around defender is also its most important offensive player. That’s the kind of luxury a team has to couch in long-game thinking; asking too much of LeBron over the full term of a playoff series risks wearing him down, possession by possession, until compromising much of what makes him so good. A fresh, physical James could be more than the Warriors can handle. A sapped, overextended James wouldn’t have access to the level of command the Cavs desperately need. As such, James might be best off assuming a lesser defensive role—like guarding Iguodala or Barnes—for as long as possible. Churning in the background, however, is the distinct possibility that Cleveland’s rotation might not allow it. J.R. Smith will walk a fine line in taking on Klay Thompson. Kyrie Irving will pick up Curry to start, though we’ll see Iman Shumpert and Matthew Dellavedova share in that responsibility at times. Tristan Thompson will likely be tabbed to guard Green by process of elimination, though his minutes will be fairly modest. Irving is in line for the biggest challenge of his basketball career: a ringer of pick-and-rolls and pin-downs that has effectively neutralized some of the best defensive players and systems in the league. His knack for suboptimal positioning will be attacked, as will his chemistry with a number of defensive partners. Should the Cavs start switching in an effort to stall the Warriors’ execution, then Irving will be all that stands between players like Green, Barnes, and Thompson as they work the post. Otherwise, he’ll have be tasked with restricting Curry through any means possible and spending his most in a constant, desperate state of recovery. 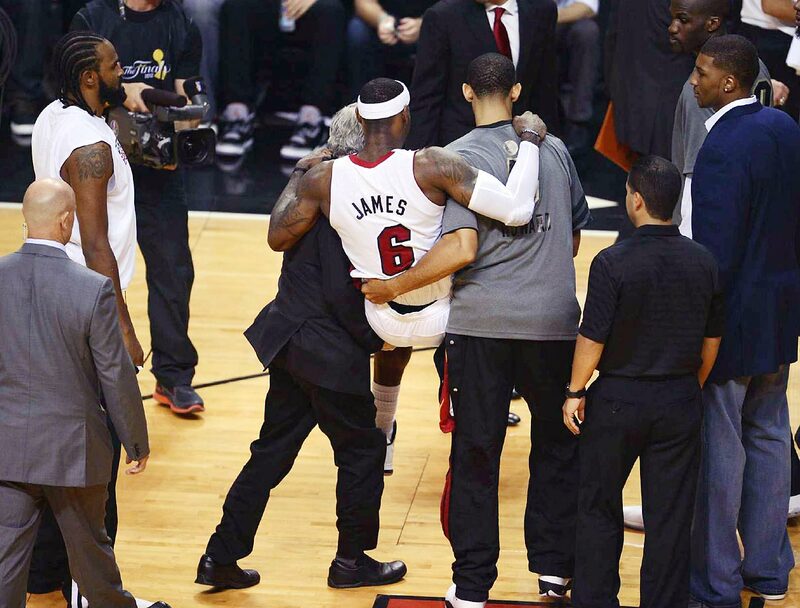 The only evidence that suggests he might be up for the challenge is part of one game in last year’s Finals. Otherwise, most of the precedent on film points to this matchup being a problem—especially if the Warriors are able to knot up Irving and Love directly via two-man actions. 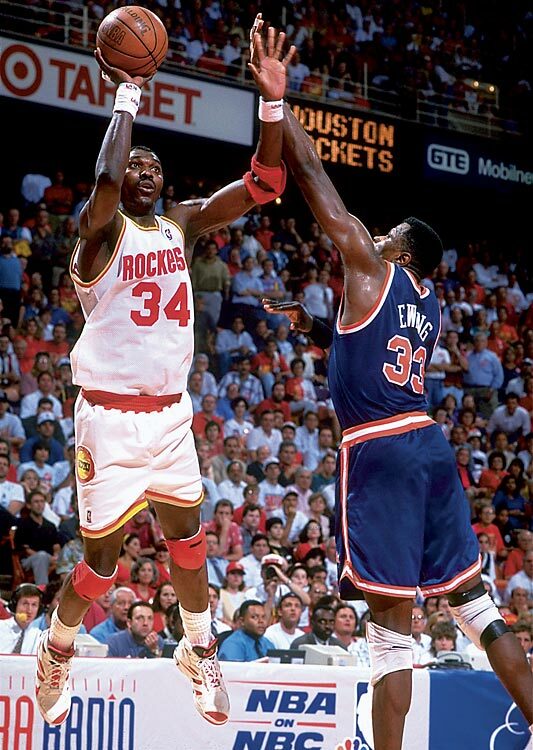 Rarely are those two on the same page, which often either forces an additional rotation from elsewhere on the floor or yields an immediate opening. With Curry involved, there now exists the possibility that he might pull up for a three-pointer without really driving into the defense at all, should Irving and his pick-and-roll partner botch their defensive exchange. Kerr never really committed to one primary defender against Irving in the regular season matchups between these two teams, though Thompson is decidedly the best direct choice among those available. 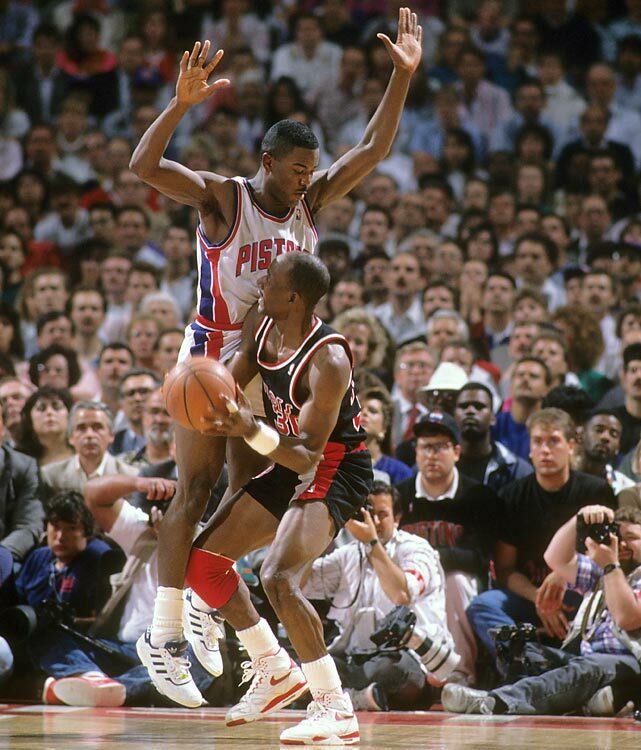 Few perimeter defenders in the league do a better job of angling a ball handler in the direction of the help before continuing in pursuit; point guards, in particular, can feel Thompson right on their heels even after they turn the corner, and tend to rush shots or dribble into trouble because of it. Irving would be a handful in his own right, but Thompson is up to the challenge of hanging with his deceptive dribble and recovering to contest Irving’s mid-range jumpers. The real trick will be if Thompson, should he get the job of defending Irving full-time, can fully make his way back into position when Cleveland transitions quickly into its offense. At the moment the Cavs collect a defensive rebound, Irving—who will essentially never defend Thompson in this series—might be on the opposite side of the court with a significant head start on the break. 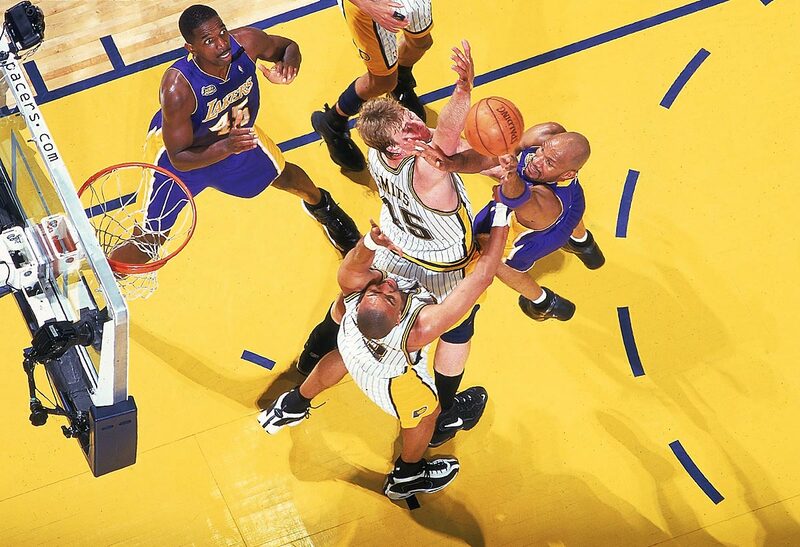 It’s then that the Warriors will need to pick up as they can and survive a possession at relative disadvantage, even if the action slows to attack their potential mismatches. Golden State will have some options in those scenarios and is better equipped to scramble in transition than most. What they might not have is time; if Irving and James are running the ball aggressively, even a frantic point or call to a teammate might not come soon enough. It’s there that these kinds of cross-matches can fall flat. Whatever advantage there is to be gained by having Thompson defend Irving in half-court situations has to be protected in the chaos of a transition free-for-all. 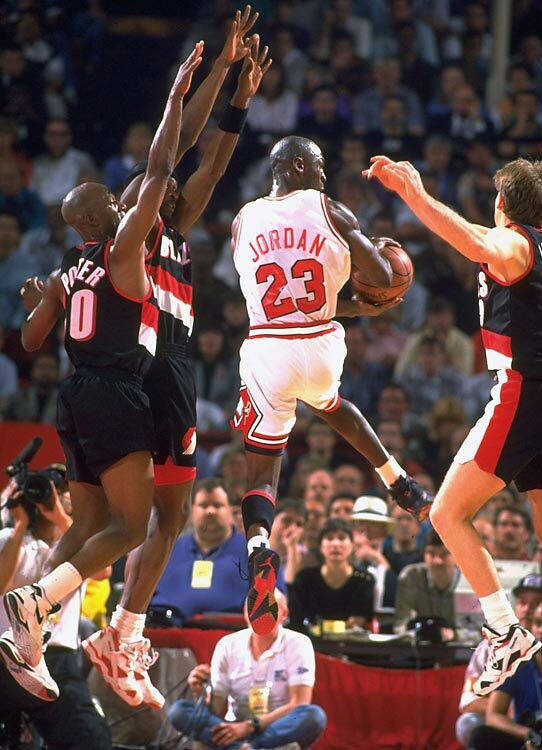 Even an isolated, dedicated matchup like this one can only succeed with the help of Thompson’s teammates.